We, Aalok Metals & Minerals was established in the year 1988 an eminent entity engaged in manufacturing, supplying and exporting a diverse range of Mining, Agriculture and Other Engineering Implements that are known for their genuine quality, durability and performance. With our engineering excellence and professional business practices, we have established a strong foothold in the industry. Garnering the strength of cutting edge technology and technically sound team, our products are sheer outcome of engineering excellence. Our range of products is absolutely versatile and serves a vast industrial spectrum. While the industrial couplings are extensively used in industries like Mechanical, Engineering, Oil& Gas etc, our gears and gearboxes serve the Automobile industry and the mining parts are an essential need in the mining and earth moving industry and the list goes on. A state of the art manufacturing unit, sound warehouse and packaging facilities, a great team dedicated to offer only the best to the clients, strong bonds with the vendors are all that we possess to offer matchless quality products and services to our esteemed clients. We are extremely adored and respected by our clients for our commitment to product quality, services and timeliness and thus are bestowed with a huge clientele spread across the globe. Our team consists of design and plant engineers, quality analysts, technical experts, R&D personnel, warehousing, packaging and logistics staff and sales and marketing executives. Each department has proficient staff which possesses immense expertise and experience in the domain. Our regular trainings and skill enhancement programs keep them aware of the latest technology and enhance their skills to be in sync with current technology trends. The close coordination of the team and its cordial relation with the clients helps deliver excellent products and services that meet the client expectations. 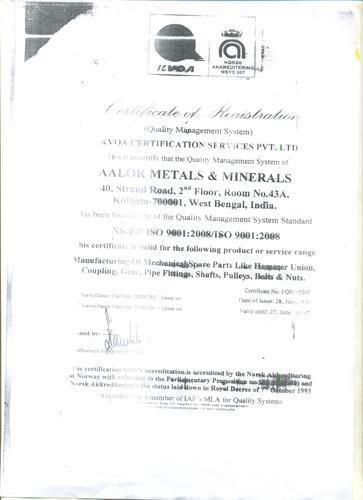 Aalok Metals & Minerals is engaged in offering a wide variety of products suitable for several industrial applications. Our product array includes Industrial Couplings consisting of Pipe Coupling, PE Coupling, Dresser Type Coupling, Victaulic Type Coupling, Industrial Tees Coupling, Toggle Coupling, Junior Compression Coupling, Repair Clamp, Flange Adapter, Mining Spare, Hydraulic Cylinder, Mechanical Gear and Gearboxes and Pipe Fitting Spare. Best quality raw material and latest manufacturing technology goes into the making of these engineering little wonders. Our products also boast of several distinguishing features like longevity, chemical stability, high corrosion resistance, non-toxic and environment friendliness, and hence are in huge demand across a wide spectrum of industries. Leveraging on our engineering capabilities and excellent infrastructure, we at Aalok Metals & Minerals offer customization of our entire product range or even undertake design and development of completely custom made products to suit the client application requirements. The customization can be offered on several parameters like size, torque levels, fabrication material, functionality, operating temperatures etc based on the type of the product. We are enabled by latest technology and CAD/CAM facilities which offer a great help in the detailed design and prototyping of the custom products and thus ensuring smooth and accurate development of the custom products with appropriate client involvement in the process. There are two factors which make the list of the industries we serve endless. One is the versatility of our range and second is huge demand from the industries themselves owing to the excellent quality and performance of our products. Our range of Industrial Couplings, Clamps, Flange Adapters, Mining Spares, Mechanical Gear and Gearboxes and Pipe fitting components find varied applications in the following industries.